Last week the recently re-named Scottish Association of Motor Sport Clubs (formerly known as the Scottish Association of Car Clubs) met for its usual regular quarterly meeting. Makes you wonder where the MSA (as was!) got the idea from, eh? Speaking of which, it was confirmed at the meeting that four senior personnel have left Motorsport UK in the past couple of months. As intimated previously in these pages, this announcement couldn’t be confirmed until officially acknowledged by MS UK, but two have left for personal reasons. The four are General Secretary, Simon Blunt, who attended the full duration of the FAI in Edinburgh a year ago, Safety Director Kate Adamson, Training Executive Alan Page, and Ben Taylor, Managing Director of International Motor Sports, which is the MSA’s commercial arm, and as such took charge of Wales Rally GB. As ever, the SAMSC quarterly get-together was a busy affair, with many of the subjects discussed representing recurring topics and concerns, but there was nothing like a full attendance from member clubs, which is a pity. We’re all in this together and the sport needs a strong structure if it is to survive. In all fairness, hosting an evening meeting in Stirling is always going to present clubs in the far north and the deep south with travel issues, but there are only four meetings per year. On the other hand the present Committee has succeeded pretty well in keeping clubs informed (if only they bother to look!) publishing written reports submitted by clubs, championships and the various sporting disciplines ahead of each quarterly meeting for delegates to read before they turn up. As long as the club reps have read these then they can arrive at the meetings and get straight on to business rather than listening to oral presentations first then a curtailed discussion afterwards. Each meeting is then followed up with Action Plans and the ever efficient Chair’s subsequent report (already issued to clubs the day after the meeting!) and which are all readily accessible on the SAMSC website. On that basis, the system works pretty well, but nothing beats face to face discussions on troubled topics and the chance to catch up with other like minded folk over the shortbread-less (another sore point!) coffee break! One perennial topic concerns marshalling – the attraction, training and retention thereof. So far, no-one has come up with a scheme that successfully achieves all three aims. For sure we are getting close and the MS UK’s current scheme is the best that they have created so far. The Welcome Pack for each new Marshal is a great idea, but more needs to be done to incentivise and reward these vital volunteers. I’m not suggesting for a minute that we reward them with cash. The sport can’t afford to pay 10,000 weekend warriors to turn up and man their stations. That would kill the sport quicker than the world’s funniest joke (see Monty Python sketch: https://www.youtube.com/watch?v=ienp4J3pW7U) but they do need to know that their efforts are recognised and appreciated. The last thing we need is some poor sodden wet, bedraggled and frozen sod, clad in dripping ice encrusted dayglo orange and standing out in the elements being harangued and berated by a warm and dry driver and co-driver for writing the wrong time in the wrong box on their TimeCard or dripping water over their paperwork. That’s for CLOs to sort out, surely. The idea of ‘goodie’ bags for rally Marshals is a great idea. Especially if they contain some life sustaining nourishment like a bottle of ginger, bag of Haribo, crisps and choccy bic (for instant energising sugar rush of course, and not to be recommended as part of an otherwise healthy diet – end of Public Health & Safety announcement) plus any other goodies that can be sourced from donors and sponsors – and maybe a woolly hat for the more northern based events. But perhaps we can, and should, do more. As part of this, the idea of incentive/rewards scheme has long been mooted but no long term campaign has ever been successful. Which called to mind an idea which was launched in the mid 1980s but failed because of lack of club/event response, but could be resurrected now given that we have access to new technology. The original scheme awarded points on an attendance basis. The more events a Marshal attended the more points he/she got and at the end of the season when special prizes would be awarded to those who had turned out and officiated most often. The Scottish Rally Championship actually launched a scheme backed by Golden Wonder Crisps who sponsored equipment as prizes and a trophy or two. The idea was that each club/event would photocopy their Marshals’s signing-on sheets and post them to the Co-ordinator to allocate points. Hard to believe now but photocopiers weren’t quite mainstream 30 years back, and although the scheme got off to a great start, it lost impetus. Perhaps this idea can be resurrected quite easily now. By taking a photograph of signing-on sheets with a smartphone such information could be sent much more quickly and easily these days. Every Marshal and Official has to be signed-on, haven’t they? All we need is a mug, sorry, volunteer, to co-ordinate the scheme and manage a spreadsheet. Simples, eh? Or maybe not. No doubt some jobsworth will pipe up and moan about personal information and the data protection act, but there must be a way round that for such a scheme as this, surely. I don’t see this as a UK national scheme, more a regional scheme or championship scheme just to keep costs under control and co-ordination manageable, but who knows, the idea might have merit on a grander scale. Another successful (as judged by those who were there) event which was poorly attended was the recent ‘Club Development Day’ which was hosted and run by Rory Bryant and Gillian Day at Scottish Motor Sports. What these two have proved is that you CAN teach an old dog new tricks, and given that many clubs are run by ‘auld dugs’ these days, that’s as good a reason for turning up as any. 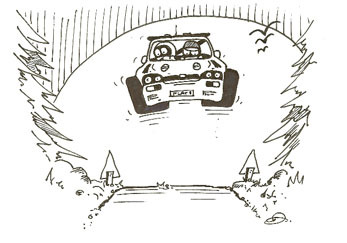 Many current club committees may think they know how to run a successful club and organise popular events, but with declining numbers of club members and competition licence holders right across the UK we need to employ new ideas and technology to reach out to folk, and just like Marshals – attract, enthuse and retain. So next time SAMSC/SMS organise such an event, try and get some of the youngsters from your club to attend. And finally, Training. Another contentious subject you may think, but vital for the future of the sport, across all disciplines. 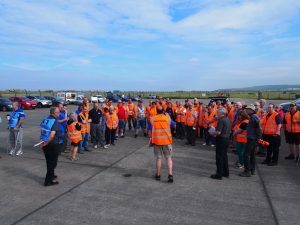 It’s not just Marshals who need to be trained but everyone who holds an ‘official’ post or duty on an event, from Timekeeper to Clerk of the Course. Unfortunately, it’s not only the sport which demands trained and qualified officials these days. We are all only too well aware that the wider society is making these demands too. The sport cannot ignore this and must comply. If we don’t, there is an army of legislators and legal firms who can be called upon by the unsatisfied and the aggrieved to swoop on us poor unfortunates who are only doing our best. The days of ‘doing your best’ is not quite good enough in these cantankerous times, hence the need for training. There are many old hands out there who get quite indignant at the idea of them needing ‘training’ and perhaps we need a new word for such a practice. They don’t actually need ‘trained’ just introduced to new standards which have to be met. The process itself can be quite enjoyable as it provides the chance to meet up with like-minded folk and discuss the new practices/standards which have to be met. Because that’s what training is all about – learning. Trainers will learn just as much from these sessions as those in the body of the kirk. It’s always a two-way process, so next time there is a Training Day, please participate. The SAMSC will advise of upcoming Training Days on their website but clubs and individuals can always contact them for specific needs. Of course staging such events can be costly, but MS UK will at least subsidise the costs if not cover them all. So what’s to lose but a bit of time? Just the future wellbeing of the sport if we don’t! Anyway, just some thoughts from a quiet observer. Anyone else got any better ideas?